I’d like to say…Ok…it’s What I Ate Wednesday! Whether it’s a full week or a slow week, filled with parties or just real life, Wednesday means one thing, the fantastic party hostessed by Jenn at Peas & Crayons! After feasting your eyes here…hop over there to drool and leave a few comments. It is the best fun. Again, we’re supposed to be talking about sensible snacking. I think I’m failing again although, I have been making overall good choices. I think if I think too much about snacks, then I want them so here’s this week for me. 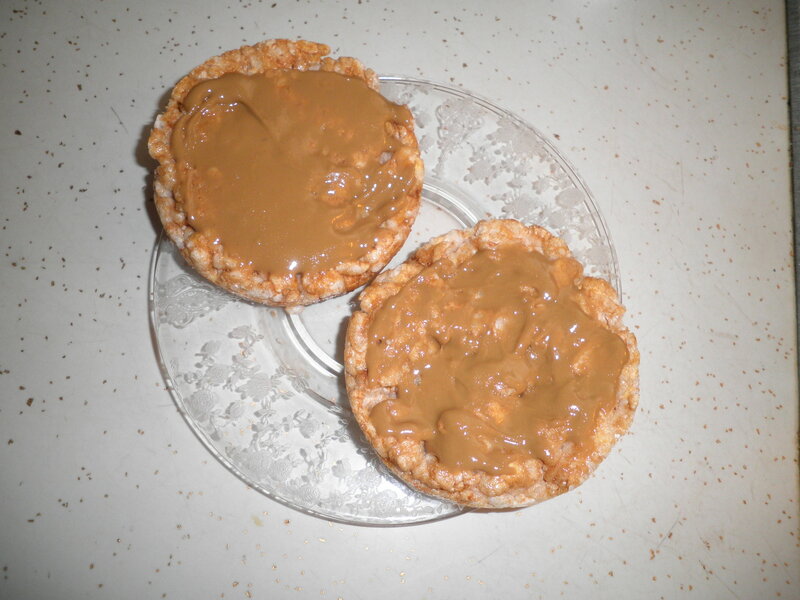 Favorite new snack…sunbutter on caramel corn rice cakes…Yum! Filling, too. My Sunday ice cream, much smaller this week for which I am proud of myself. A small cup of coffee and butter almond…my two favorites! This could be a lunch or snack…it was in that mid part of the day…pineapple Greek yogurt, Fiber One and a good book. Great combo in my opinion! Add a Morningstar Farms tomato basil pizza burger to it and it couldn’t be better. I now have bottled dressing to finish up before I start back to making my own again. This is pretty good and only 1 gram of fat per serving. 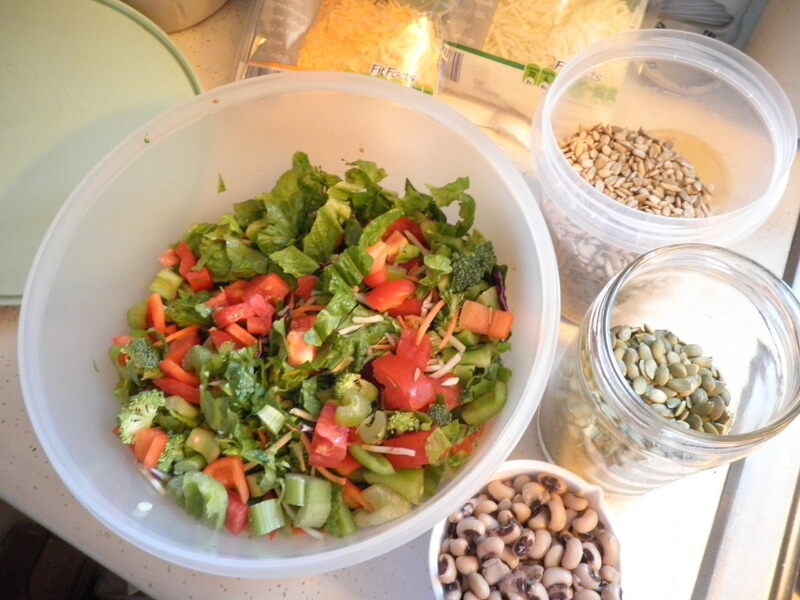 The very last of the salad with sunflower seeds, pumpkin seeds and crock pot black-eyed peas added. The Big Purple Bowl is getting a work out! Shredded cheese added-Aldi has their 2% cheese available again, Hooray! 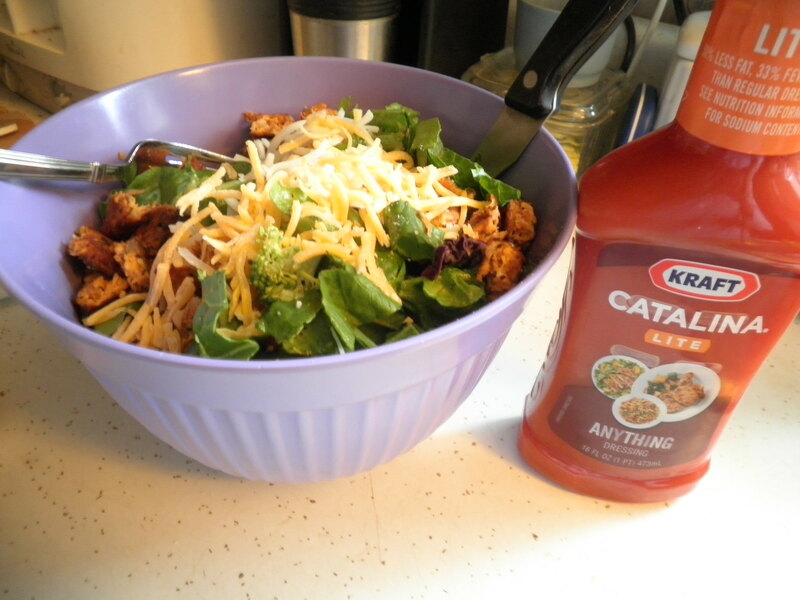 A combo mixture of light balsamic and lite catalina…Tangy and Tangy! Be sure to head over to Peas & Crayons, look around, leave some comments, have some fun. That’s what this is all about!! This entry was posted in Uncategorized and tagged Big Purple Bowl, books, ice cream, salads, Weight Watchers, WIAW. Bookmark the permalink. fran, i saw that rice cakes on sale this week over at our valumart, and i thought of you right away! caramel is included…i should pick some up for snack time! and i’d put pb on mine, too! your ice cream combo sounds very yummy – i love when you can get half and half in your cup! lite catalina!! that is my standard salad dressing! glad you like it well enough! the cover of your book makes for quite the intriguing lunch photo – haha! glad your bp bowl is getting lots of use! Yes, Cathy…the book cover is a little “leggy.” Love those rice cakes, just enough flavor and sweetness to make it like a treat. The ice cream is so good there. That’s the first place Ele and I would take you if you were visiting…oh, but you’ll be visiting us in NM. Darn…there’s an ice cream place in town there, but we haven’t tried it yet. It’s right next to our favorite coffee place Java The Hut and we always seem to go there instead! Hi Cindy! Thanks for commenting! I try to keep my snacks to a minimum because otherwise I get carried away!! I keep forgetting I have little tiny rice cakes at home! they’d be perfect right now at work. agh. Ohh, you kill me with all your amazing ice cream! Coffee this week, black raspberry last…yummmm. Allie, this is just the best ice cream place. The building used to be a service station and it’s owned by a guy I’ve know since kindergarten. Cool! Ice cream is such a fun snack! Sometimes I do frozen yogurt instead but usually I’m secretly wishing it’s ice cream (or hazelnut gelato). Stacie, I try to only do ice cream on the weekends and I’m pretty good about it. Also glad I only had a small serving this time. There’s only one frozen yogurt place around here and I haven’t tried it,yet. Probably shouldn’t!! I am a HUGE fan of MorningStar pizza burgers! Soooo yummy! And how have I never had butter almond ice cream? That sounds amazing! Anna, butter almond is So delcious. It’s my favorite! Love the pizza burgers too! And your ice cream sounds (and looks!) delicious as well – I need to get some,too,soon! Hi Kat! You can order the Sunbutter on line, but I think it’s more expensive there but I’m still researching. Target is the closest place I can find in my area but it’s still kind of expensive~over $4 a jar. 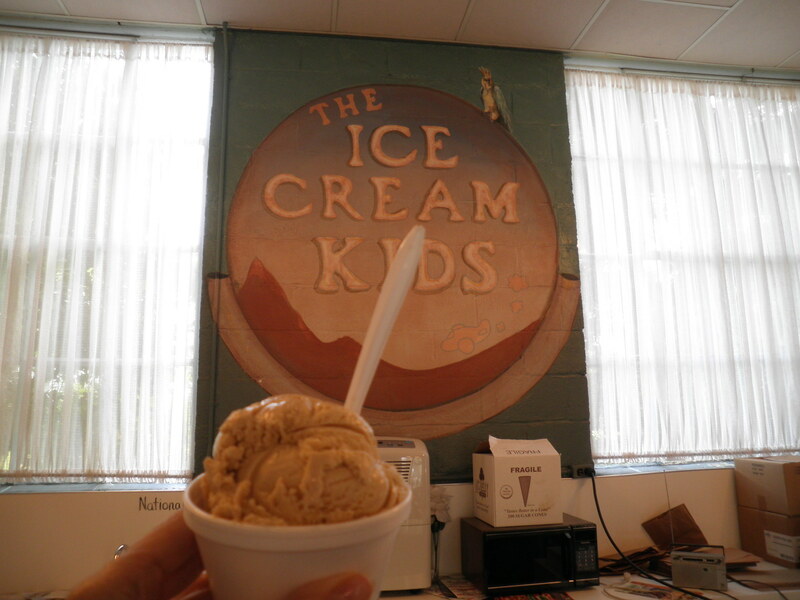 The ice cream at this little place in our town is So good!! Oh, Dana, I wouldn’t want to tempt you… 😉 I tell myself I can have it once a week either Saturday or Sunday and that’s it. It works pretty well in spite of the fact that the ice cream place is only 4 blocks away!! Love it when I get to bring home party leftovers. That salad looks delicious! Thanks, Corrie Anne! 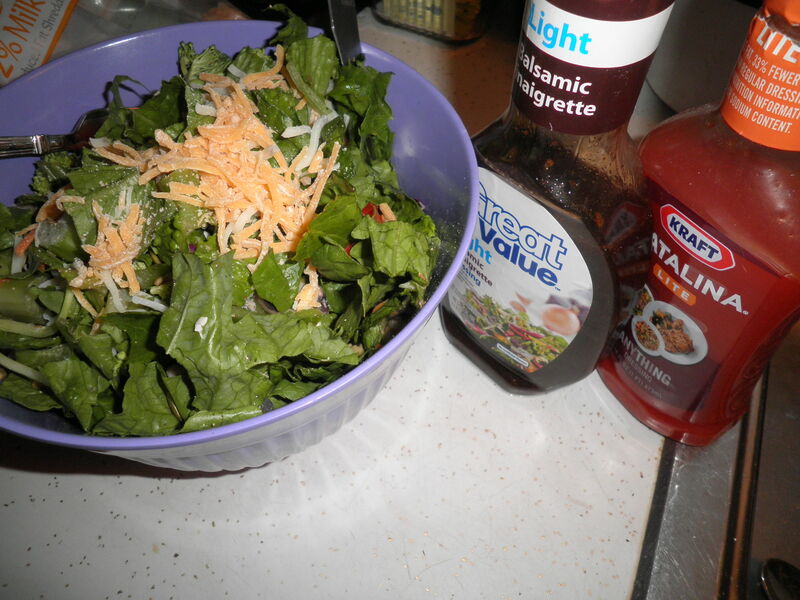 I love salads…they just do it for me. They can be whatever I want them to be, I’m never bored!